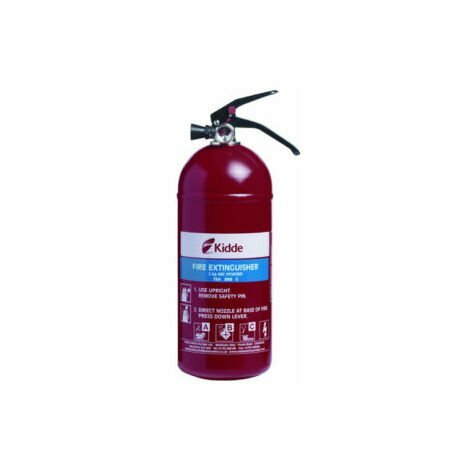 This Kidde KIDKSPD2G Multi-Purpose 2.0kg ABC Fire Extinguisher is a large capacity, dry powder fire extinguisher. A = Wood, paper and textiles. B = Liquid fires, such as petrol, oil and paints. The extinguisher is also safe for use on electrical fires. It is suitable for use in vehicles and boats. The KSPD2G is easy to mount on a wall with its wall bracket and strap, and its smaller size means that it is suitable for use in vehicles, boats and caravans. The extinguisher is easy to use – simply pull the pin, press the trigger and aim at the base of the fire. A pressure gauge on the extinguisher gives constant reassurance that the unit is ready for use. It exceeds the requirements of the Gas Safe Register, has a 13A 89BC Fire rating and is approved to EN3.